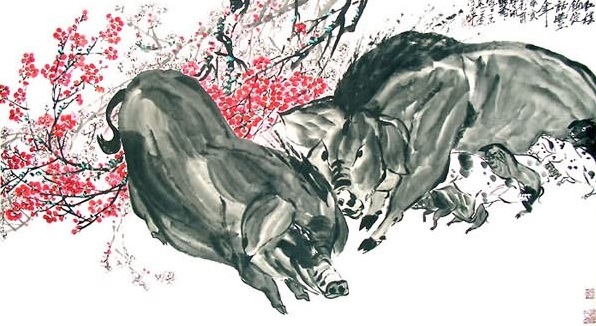 The year of the Pig or Boar is acknowledged as one of prosperity and joy. During this year, the Pig's noble attributes of kindness and compelling positivity rub off on the whole of the earth. The Boar is the last of the 12 animals that make up the Chinese zodiac. It is a time of peace and plenty and so much more! The ancient Chinese born in the year of the Pig watched out for the numbers 3, 1 and 9 and chose not to wear red, blue and green on important days. They are also said to be most compatible with people born in the year of the Goat and the Rabbit, and were seldom at ease with those born in the year of the Snake and the Monkey. Children born in the year of the Pig are well-loved for being happy, lively and helpful, not to mention that they are living lucky charms for richness and protection! They also equal the Ox children in terms of vigor, loyalty and patience. For the Chinese, the pig is an unbeatable symbol of abundance, peace and propriety. By displaying an image or figurine of a pig, the Chinese are certain to invite wealth and good energy into their home. The Pig is also a symbol of contentment, protection from negative vibes, as well as virility. According to legend, there was a tribe whose leader had a pig's head. These were the Kitan, who are Manchurians that came to conquer vast Northern China territories from 916 to around 1122. The Chinese deity Xuan-tan is an immortal that prohibits his followers to kill pigs, even for sacrifice rituals and holy offerings. 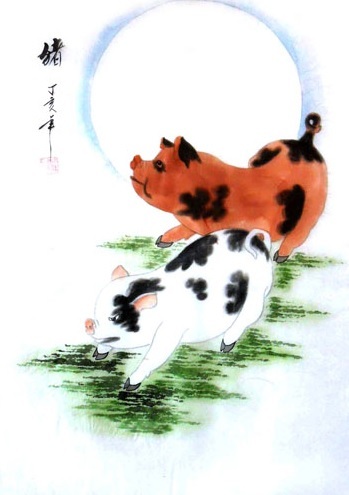 In ancient times, Xuan-tan's devotees were also forbidden to eat pigs. Chu Pa-Chieh is another Chinese god who was half-man, half-pig. Nope, he wasn't born that way. Chu Pa-Chieh was punished for some naughtiness he committed while on exile on earth by the Jade Emperor Yu Huang. The Jade Emperor is a very powerful, if not the most famous, god in the Chinese pantheon as he is the official ruler of heaven and all the other worlds of existence. A god assigned to the protection of pigs was Zhu Zhi Zhen, while the immortal Zhu Juan Zhen was the deity in charge of pigsties. I hope you found this zodiac page helpful and interesting. Please check out my other Chinese zodiac symbols pages soon. I'm still writing most of them and I hope you bear with me in populating my new website with relevant content. It really takes a lot of time to write just one page:-) sigh! Want to switch pages? Go back from Year of the Pig to the main Chinese Zodiac Page. Return to the Symbolisms home page here to see more fascinating symbols and meanings. *Many thanks to artists Ye Liu and Jian Feng of inkdancechinesepaintings.com for their captivating, original paintings on this page.